Henry Guy to Mr. Hewer for a certificate what sums were received at Tangier from the agents of Sir James Shaen and partners, on what days, and whether you, said Hewer, or anybody else are charged therewith in the accounts of the garrison of Tangier. Out Letters (General) XI, p. 346. Same to the Board of Greencloth to report on the enclosed petition [missing] of Widow Stisted and the order of Council thereon. Ibid, p. 347. Treasury reference to the Customs Commissioners of the petition of Jo[h]n Baptist Seth to the King, petitioner shewing that being a native of Flanders he followed the late King in all his troubles and afterwards belonged to the Customs in Flanders, where he observed a great many things against his Majesty's interest and coming over to redress the same he had a warrant for a searcher's and waiter's place here; that his family being settled in Flanders he desired leave of the Customs Commissioners to bring them over, which being granted it took him four months in settling same; that on arrival here the Commissioners desired to see his warrant, which he gave to their secretary and could never obtain back again: therefore prays relief. Reference Book V, p. 244. April 22 [sic probably for April 2]. Treasury reference to Mr. Ryley of the petition of William Cross, shewing that he contracted with Mr. Agar for a parcel of roots in stacks in Braywood at 5s. per stack, which came to 176l. 3s. 0d., of which he has paid 120l. 8s. 0d. ; that upon opening the said roots they were so fraudulently stacked that he was forced to sell them at 4s. per stack by means whereof he is utterly ruined unless the remaining 55l. 15s. 0d. be remitted. Reference Book V, p. 244. Same to Mr. Graham and Mr. Burton of the petition of Chris. Dodsworth, shewing that in 1683 the ship Hawk was seized by privateers and having on board 24 mark of gold, ut supra, p. 1668, the owners sent it ashore to preserve it, but it was afterwards seized by one Mr. Greenhill, Agent to the African Company, whom petitioners sued for same, but before the issue was determined a privy seal was granted for the King's moiety of said gold; that petitioner and partners conceive that said gold pretended to be forfeited to the King is wholly acquitted by the King's pardon: therefore pray a restoration of same. Ibid. Treasury warrant to the Customs Cashier to pay 84l. 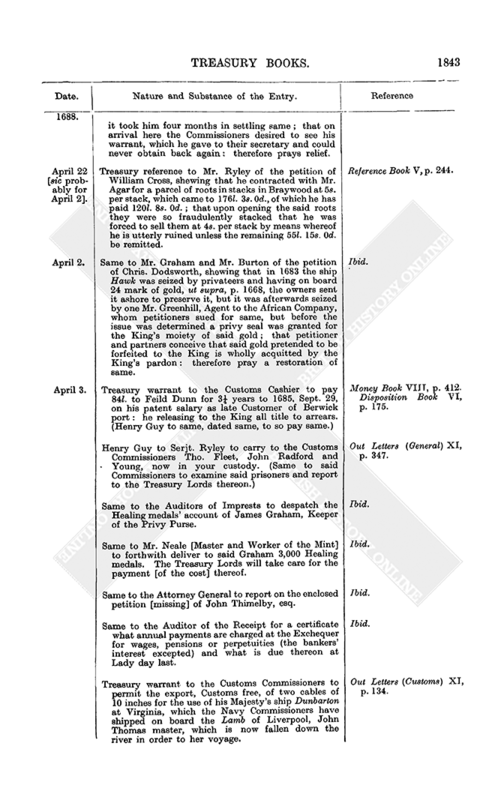 to Feild Dunn for 3¼ years to 1685, Sept. 29, on his patent salary as late Customer of Berwick port: he releasing to the King all title to arrears. (Henry Guy to same, dated same, to so pay same.) Money Book VIII, p. 412. Disposition Book VI, p. 175. Henry Guy to Serjt. Ryley to carry to the Customs Commissioners Tho. Fleet, John Radford and Young, now in your custody. (Same to said Commissioners to examine said prisoners and report to the Treasury Lords thereon.) Out Letters (General) XI, p. 347. Same to the Auditors of Imprests to despatch the Healing medals' account of James Graham, Keeper of the Privy Purse. Ibid. Same to Mr. Neale [Master and Worker of the Mint] to forthwith deliver to said Graham 3,000 Healing medals. The Treasury Lords will take care for the payment [of the cost] thereof. Ibid. Same to the Attorney General to report on the enclosed petition [missing] of John Thimelby, esq. Ibid. Same to the Auditor of the Receipt for a certificate what annual payments are charged at the Exchequer for wages, pensions or perpetuities (the bankers' interest excepted) and what is due thereon at Lady day last. Ibid. 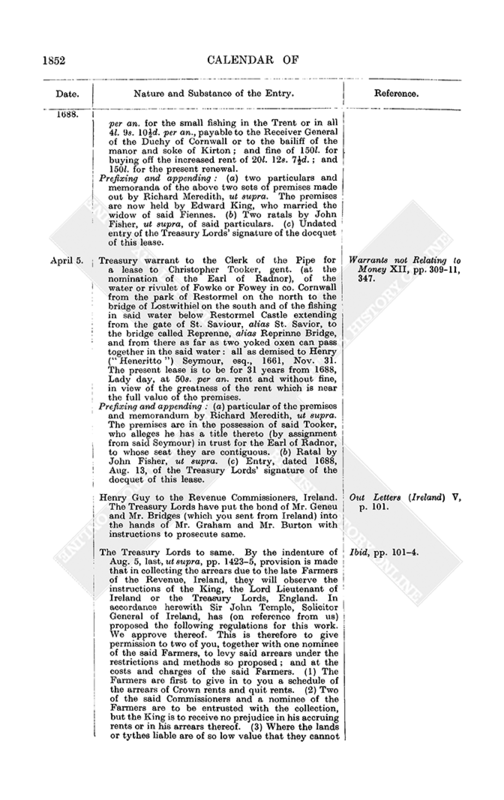 Treasury warrant to the Customs Commissioners to permit the export, Customs free, of two cables of 10 inches for the use of his Majesty's ship Dunbarton at Virginia, which the Navy Commissioners have shipped on board the Lamb of Liverpool, John Thomas master, which is now fallen down the river in order to her voyage. Out Letters (Customs) XI, p. 134. 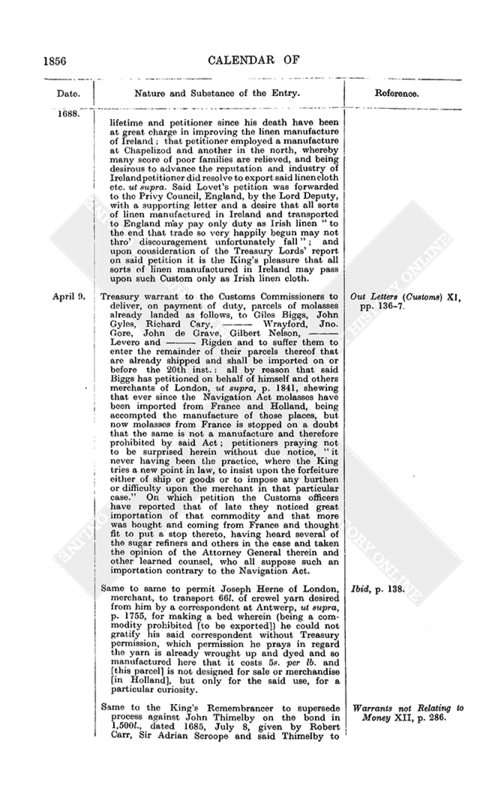 Treasury reference to William Hewer of the petition of Jos. Mitchell and Ralph Done, shewing that in 1680 they went to Tangier in Capt. Coy's Troop, "that some time after the Capt. would have them serve him and he would make the pay better, that they did the duty of troopers and the said Capt. had four servants besides his pretensions to the petitioners and refuses to pay them either as troopers or servants"; therefore pray that the muster roll be examined to prove whether they were mustered as troopers or servants. Reference Book V, p. 245. Same to Charles Toll et al. 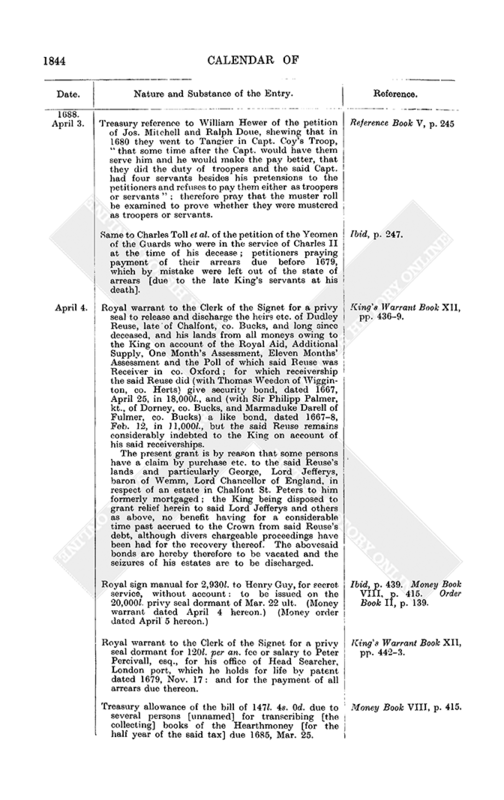 of the petition of the Yeomen of the Guards who were in the service of Charles II at the time of his decease; petitioners praying payment of their arrears due before 1679, which by mistake were left out of the state of arrears [due to the late King's servants at his death]. Ibid, p. 247. Royal warrant to the Clerk of the Signet for a privy seal to release and discharge the heirs etc. of Dudley Reuse, late of Chalfont, co. Bucks, and long since deceased, and his lands from all moneys owing to the King on account of the Royal Aid, Additional Supply, One Month's Assessment, Eleven Months' Assessment and the Poll of which said Reuse was Receiver in co. Oxford; for which receivership the said Reuse did (with Thomas Weedon of Wigginton, co. Herts) give security bond, dated 1667, April 25, in 18,000l., and (with Sir Philipp Palmer, kt., of Dorney, co. Bucks, and Marmaduke Darell of Fulmer, co. Bucks) a like bond, dated 1667–8, Feb. 12, in 11,000l., but the said Reuse remains considerably indebted to the King on account of his said receiverships. King's Warrant Book XII, pp. 436–9. The present grant is by reason that some persons have a claim by purchase etc. to the said Revise's lands and particularly George, Lord Jefferys, baron of Wemm, Lord Chancellor of England, in respect of an estate in Chalfont St. Peters to him formerly mortgaged; the King being disposed to grant relief herein to said Lord Jefferys and others as above, no benefit having for a considerable time past accrued to the Crown from said Revise's debt, although divers chargeable proceedings have been had for the recovery thereof. The abovesaid bonds are hereby therefore to be vacated and the seizures of his estates are to be discharged. Royal sign manual for 2,930l. to Henry Guy, for secret service, without account: to be issued on the 20,000l. privy seal dormant of Mar. 22 ult. 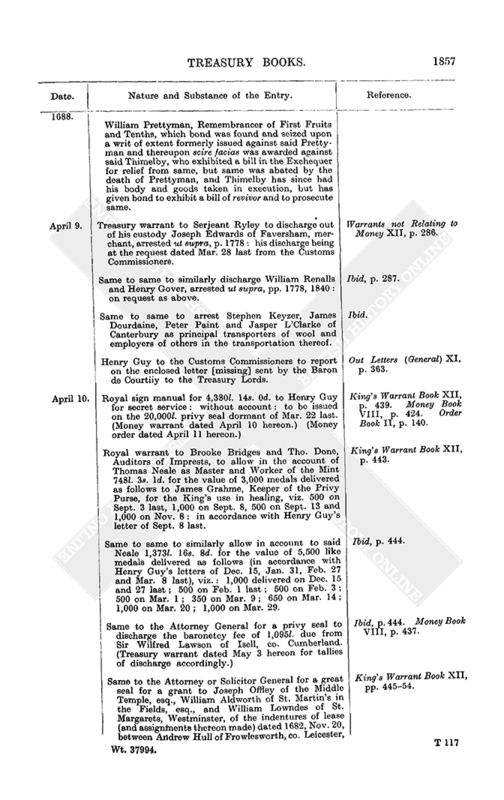 (Money warrant dated April 4 hereon.) (Money order dated April 5 hereon.) Ibid, p. 439. Money Book VIII, p. 415. Order Book II, p. 139. Royal warrant to the Clerk of the Signet for a privy seal dormant for 120l. per an. fee or salary to Peter Percivall, esq., for his office of Head Searcher, London port, which he holds for life by patent dated 1679, Nov. 17: and for the payment of all arrears due thereon. King's Warrant Book XII, pp. 442–3. Treasury allowance of the bill of 147l. 4s. 0d. due to several persons [unnamed] for transcribing [the collecting] books of the Hearthmoney [for the half year of the said tax] due 1685, Mar. 25. Money Book VIII, p. 415. Henry Guy to the Auditor of the Receipt to issue as follows out of the branches of the revenue directed to be this week paid into the Exchequer, viz. ; Disposition Book VI, pp.175–7. Out of the imposition on wine and vinegar. Out of the Letter Office money. Same to the Customs Commissioners to deliver the diamonds and other things which were taken about Father Ignatio Sta. Rosa, on his paying Customs and satisfying the officer that seized same. Out Letters (General) XI, p. 348. Same to Mr. Bonwick, bailiff of Reigate, to attend Auditor Aldworth in order to the making up your accounts to 1685, Lady day, as bailiff of Reigate, and Auditor Shales for the like accounts to Lady day last. Ibid. Henry Guy to Mr. Hoare. It is the King's pleasure that you attend him to-morrow before he sits down to dinner in his Privy Lodgings. When you are there, send somebody in to acquaint his Majesty that you are attending. Out Letters (General) XI, p. 348. Same to the Customs Commissioners, enclosing (a) infra. You are to order the Customs officers at Dartmouth to examine the ship when she comes in there. Ibid, pp. 348–9. Appending: (a) extract of a letter, dated 1688, April 9 [n.s.] sent out of Holland to [Secretary] the Earl of Middleton. Two days since Boniface Gifford, master of the Friends Adventure of 120 tons, sailed hence. He gave out that he goes to Boston in New England, but by an information which one of the English brokers gave me yesterday he [said ship] goes to Sallee to unlade there all sorts of ammunition of war. The said master intends to land at Dartmouth. Same to same to send the Duke of Grafton's goods to his house to see them opened. Ibid, pp. 349–51. Appending: schedule of goods brought from aboard his Majesty's ship Ann for the use of said Duke (including furniture, books, globes, Hungary water, vermichelle, foul linen, liveries, a Malhugoe stool in a case, flamboys, muskadell, Seragosa, Malaga, flower [flour] out of England, Jarsuf Tent, Jarsuf Lucena, Jarsuf olives, whole chests of Florence, Palmasan cheese, butter out of England, box belonging to Mr. Noades the said Duke's chirurgeon, shoger, prunell, sweetmeats, plate, brandy). Treasury warrant to the King's Remembrancer, the Clerk of the Pipe etc. to discharge Sir Walter Young, bart., from all process or molestation which might be given him by reason of his receiving or distraining the goods of Walter Teap of Axmouth, co. Devon, yeoman, Tho. Franklyn and Gideon Dare, his tenants, who were in arrear respectively 76l., 183l. 15s. 0d. and 50l. to him at Lady day before the rebellion in the West, and had forsaken their homes to go in the said rebellion, whereon he distrained on them to the value respectively of 54l. 16s. 0d., 102l. 15s. 6d. and 14l. 15s. 0d. and did pay into the Exchequer the 24l. 15s. 0d. excess so distrained upon Dare; it appearing that on their conviction of high treason they forfeited their goods and estate [to the King] and process is ordered against said Young to recover to the King the said distrained goods. Warrants not Relating to Money XII, pp. 278–9. Same to Serjeant Ryley to discharge out of his custody on parole Thomas Price of Sterry and—Iverson of Canterbury, co. Kent, arrested under the warrant of Mar. 13 last, supra, p. 1841: the Customs Commissioners having duly examined them. Ibid, p. 285. 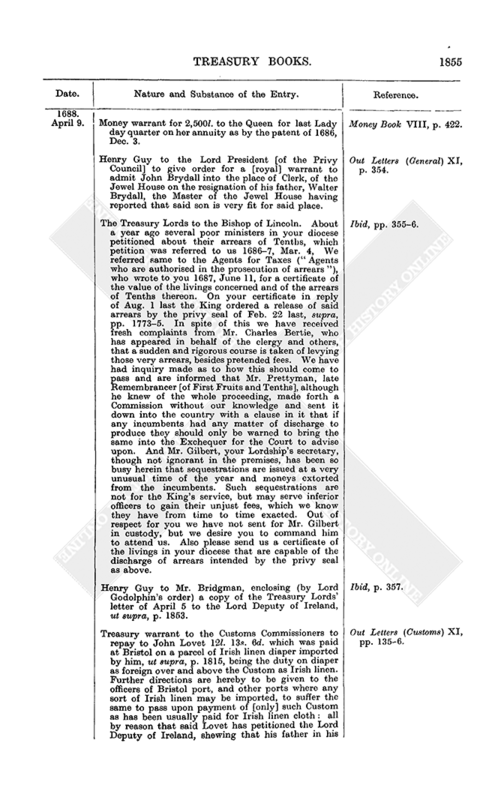 The Treasury Lords to the Lord Deputy of Ireland to report on the petition of Capt. Thomas Mackwey, which the said Lords have received from the King. Out Letters (Ireland) V, p. 101. 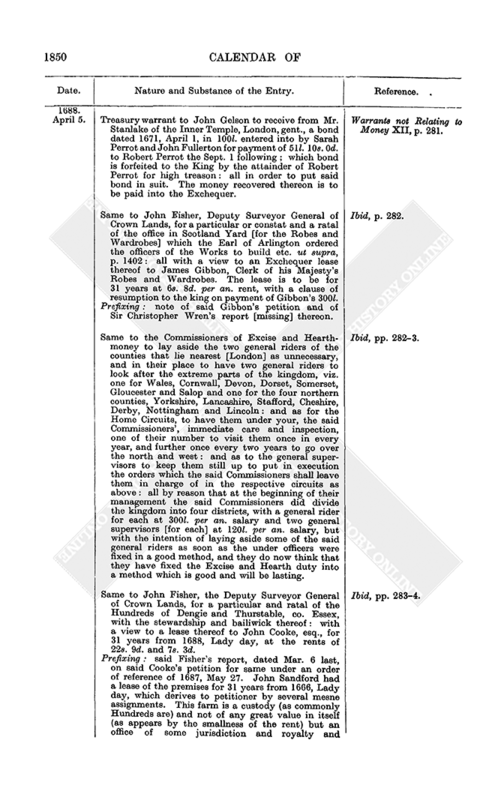 Appending: note of said petition, praying a grant of eight acres of land and some mills and weirs thereon in Kilmainham, co. Dublin, at the rent of 23l. per an., same being in petitioner's possession by a custodiam and in the King's disposal. Money warrant for 75l. to John Dryden, esq., his Majesty's Poet Laureat and Historiographer Royal, for last Lady day quarter on his several allowances of 200l. and 100l. per an. Money Book VIII, p. 415. Same for 250l. to Frances, Countess of Portland, for same quarter on her pension. Ibid, p. 416. Treasury allowance of Richard Kent's incidents bill for the year ended 1687, Sept. 29, as Customs Cashier (total, 870l. 4s. 5d., including 200l. for losses [by bad money etc.] in paying into the Exchequer 1,221,871l. 14s. 10d. [being Customs money so paid in by him during said year]). Ibid, pp. 416–7. Prefixing: said Kent's affidavits to his said bill; and certificate thereon by the Auditors of Imprests. Treasury warrant to the Excise Commissioners, Excise Auditor and Excise Comptroller to allow 16l. to Thomas Bird in his account as collector of Excise in cos. Oxford and Bucks; he having usually made his returns through Richard Davis and did entrust 16l. to him 1686, June 3, to be paid to Charles Duncombe at the Excise Office, but Davis soon after failed and did not pay same and is run away altogether insolvent: the said Bird having been guilty of no neglect and having prosecuted Davis. Ibid, p. 417. Same to Richard, Earl of Ranelagh, Paymaster of the Forces and Receiver and Treasurer for Chelsea Hospital, to pay the respective artificers and others as follows for work performed or materials furnished for the building of said Hospital. Ibid, pp. 417–8. 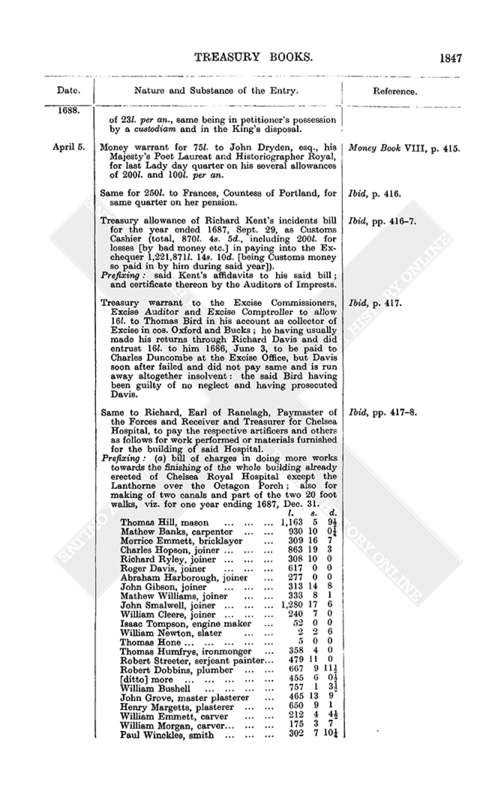 Prefixing: (a) bill of charges in doing more works towards the finishing of the whole building already erected of Chelsea Royal Hospital except the Lanthorne over the Octagon Porch; also for making of two canals and part of the two 20 foot walks, viz. for one year ending 1687, Dec. 31. (b) Certificate by Sir Christopher Wren, dated Mar. 24 last, addressed to the Earl of Ranelagh, that he has examined the accounts, compared the prices with the contracts, abated the prices of the overwork, and judges that the total may be reasonably allowed as it is cast up [above]. 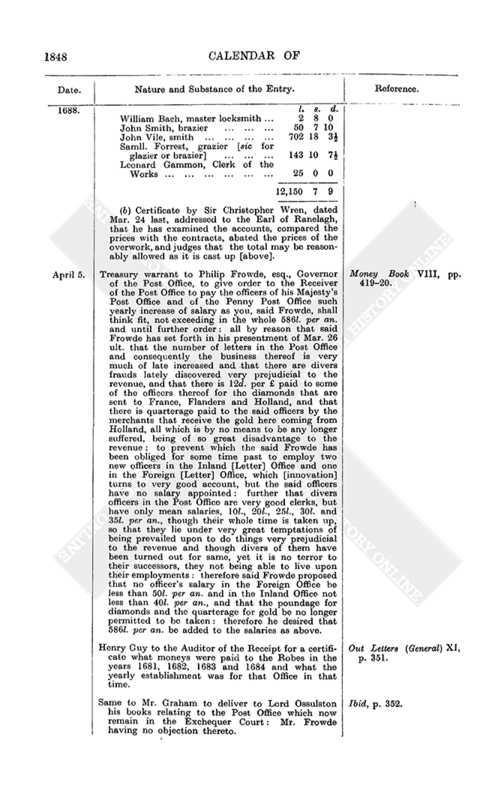 Treasury warrant to Philip Frowde, esq., Governor of the Post Office, to give order to the Receiver of the Post Office to pay the officers of his Majesty's Post Office and of the Penny Post Office such yearly increase of salary as you, said Frowde, shall think fit, not exceeding in the whole 586l. per an. and until further order: all by reason that said Frowde has set forth in his presentment of Mar. 26 ult. that the number of letters in the Post Office and consequently the business thereof is very much of late increased and that there are divers frauds lately discovered very prejudicial to the revenue, and that there is 12d. per £ paid to some of the officers thereof for the diamonds that are sent to France, Flanders and Holland, and that there is quarterage paid to the said officers by the merchants that receive the gold here coming from Holland, all which is by no means to be any longer suffered, being of so great disadvantage to the revenue; to prevent which the said Frowde has been obliged for some time past to employ two new officers in the Inland [Letter] Office and one in the Foreign [Letter] Office, which [innovation] turns to very good account, but the said officers have no salary appointed: further that divers officers in the Post Office are very good clerks, but have only mean salaries, 10l., 20l., 25l., 30l. and 35l. per an., though their whole time is taken up, so that they lie under very great temptations of being prevailed upon to do things very prejudicial to the revenue and though divers of them have been turned out for same, yet it is no terror to their successors, they not being able to live upon their employments: therefore said Frowde proposed that no officer's salary in the Foreign Office be less than 50l. per an. and in the Inland Office not less than 40l. per an., and that the poundage for diamonds and the quarterage for gold be no longer permitted to be taken: therefore he desired that 586l. per an. be added to the salaries as above. Money Book VIII, pp. 419–20. Henry Guy to the Auditor of the Receipt for a certificate what moneys were paid to the Robes in the years 1681, 1682, 1683 and 1684 and what the yearly establishment was for that Office in that time. Out Letters (General) XI, p. 351. Same to Mr. Graham to deliver to Lord Ossulston his books relating to the Post Office which now remain in the Exchequer Court: Mr. Frowde having no objection thereto. Ibid, p. 352. Henry Guy to the Customs Commissioners to deliver, Customs free, the following goods now in the Pearle, William Button captain, now riding in the Downs, which are a present to Lord Waldegrave from Mr. Fitz James. Out Letters (General) XI, p. 352. Appending: list of said goods (including Parmasan cheese, Florence wine, Syracuse wine, anchovies, sugar plums). Same to Visct. Preston [Master of the Great Wardrobe] to provide as follows except that part thereof which relates to the bare hide and trunks. Ibid, pp. 352–3. Appending: warrant, dated Mar. 10 last, from the Earl of Mulgrave [Lord Chamberlain of the Household] to Visct. Preston to deliver to James Graham (as Keeper of the Privy Purse) a bare hide and two travelling trunks, and (as Master of the Buckhounds) a waggon cloth to cover the waggon that carries the dogs. Same to Mr. Corbyn at Hall End near Coleshill in Warwickshire for an account what timber (not fit for the Navy) you think may be felled this year in Sherwood Forest. Ibid, p. 353. Same to the Customs Commissioners to deliver the following goods to Madame La Gouverne on payment of Customs. Ibid, p. 354. Appending: list of said goods (fans (éventails de santeur, éventails de rid), crape, ribbon, balls, etc.). Treasury reference to the Hearthmoney Commissioners of the petition of Jo[h]n Ady and Hen. Ballow, Deputy Chamberlains of the Exchequer, for joining tallies, petitioners praying the like allowance of 2s. per 1,000l. for joining Hearthmoney tallies [for moneys paid into the Exchequer by the Receiver General of Hearthmoney], viz. for the 2½ years ending 1686, Sept. 29, as they receive for the Customs and Excise tallies [for like payments in]. Reference Book V, p. 247. Treasury warrant to the Clerk of the Pipe for a lease to Joseph Ellis of a tenement in Linkinhorne, co. Cornwall, at one time in the tenure of John Coll, parcel of the manor of Carnedon Prior, and of the Priory of Launceston and now annexed to the Duchy of Cornwall: all as demised to Peter Roberts 1627, Nov. 24, for 99 years terminable on the lives of Paschasia wife of said Peter and John and William their sons; and as afterwards demised to Henry Seymour 1664, April 24, for 99 years terminable on the life of Henry Trelawney, son of Jonathan Trelawney (late Sir John Trelawney, bart., deceased). The present lease is to be for 99 years terminable on three lives at the old rent of 6s. 4d. per an. and fine of 9l. for buying off the increased rent of 3l. per an. and 14l. for the present renewal. Warrants not Relating to Money XII, pp. 279–81. 323. Prefixing and appending: (a) particular of the premises and memorandum made out by Richard Meredith, deputy auditor of the Duchy of Cornwall. The premises are held by said Ellis by several assignments for the lives of William Roberts and Henry Trelawney. (b) Ratal by John Fisher, Deputy Surveyor General of Crown Lands, of said particular. (c) Entry of the Treasury Lords' subscription, dated 1688, May 20, of the docquet of this lease: the three new lives being given as John Ellis, Rebecca Ellis and John Dingle, junr. Treasury warrant to John Gelson to receive from Mr. Stanlake of the Inner Temple, London, gent., a bond dated 1671, April 1, in 100l. entered into by Sarah Perrot and John Fullerton for payment of 51l. 10s. 0d. to Robert Perrot the Sept. 1 following; which bond is forfeited to the King by the attainder of Robert Perrot for high treason: all in order to put said bond in suit. The money recovered thereon is to be paid into the Exchequer. Warrants not Relating to Money XII, p. 281. Same to John Fisher, Deputy Surveyor General of Crown Lands, for a particular or constat and a ratal of the office in Scotland Yard [for the Robes and Wardrobes] which the Earl of Arlington ordered the officers of the Works to build etc. ut supra, p. 1402: all with a view to an Exchequer lease thereof to James Gibbon, Clerk of his Majesty's Robes and Wardrobes. The lease is to be for 31 years at 6s. 8d. per an. rent, with a clause of resumption to the king on payment of Gibbon's 300l. Ibid, p. 282. Prefixing: note of said Gibbon's petition and of Sir Christopher Wren's report [missing] thereon. Same to the Commissioners of Excise and Hearthmoney to lay aside the two general riders of the counties that lie nearest [London] as unnecessary, and in their place to have two general riders to look after the extreme parts of the kingdom, viz. one for Wales, Cornwall, Devon, Dorset, Somerset, Gloucester and Salop and one for the four northern counties, Yorkshire, Lancashire, Stafford, Cheshire, Derby, Nottingham and Lincoln: and as for the Home Circuits, to have them under your, the said Commissioners', immediate care and inspection, one of their number to visit them once in every year, and further once every two years to go over the north and west: and as to the general supervisors to keep them still up to put in execution the orders which the said Commissioners shall leave them in charge of in the respective circuits as above: all by reason that at the beginning of their management the said Commissioners did divide the kingdom into four districts, with a general rider for each at 300l. per an. salary and two general supervisors [for each] at 120l. per an. salary, but with the intention of laying aside some of the said general riders as soon as the under officers were fixed in a good method, and they do now think that they have fixed the Excise and Hearth duty into a method which is good and will be lasting. Ibid, pp. 282–3. Same to John Fisher, the Deputy Surveyor General of Crown Lands, for a particular and ratal of the Hundreds of Dengie and Thurstable, co. Essex, with the stewardship and bailiwick thereof: with a view to a lease thereof to John Cooke, esq., for 31 years from 1688, Lady day, at the rents of 22s. 9d. and 7s. 3d. Ibid, pp. 283–4. Prefixing: said Fisher's report, dated Mar. 6 last, on said Cooke's petition for same under an order of reference of 1687, May 27. John Sandford had a lease of the premises for 31 years from 1666, Lady day, which derives to petitioner by several mesne assignments. This farm is a custody (as commonly Hundreds are) and not of any great value in itself (as appears by the smallness of the rent) but an office of some jurisdiction and royalty and conveniency to a gent. and of some advantage to one bred in the practice of the law. Entry of [the Treasury Lords' signature of] the docquet of an in custodiam lease under the Exchequer seal to John Chilcott, alias Commins, of divers lands and tenements in co. Devon of Charles Camworthy, outlaw: at a rent of 5s. per an. and fine of 10s. Warrants not Relating to Money XII, p. 284. Treasury warrant to the Clerk of the Pipe for a lease to John North of a parcel of meadow and pasture called Northcot Peece, containing 20 acres, situate in Shippon, co. Berks, formerly in the tenure of John Tyndall and parcel of the manor of Shippon and Duchy of Cornwall: all as demised to John Ward 1664, May 30. The present lease is to be for 31 years from 1687, Sept. 29, at the old rent of 6s. per an. and fine of 12l. and 8l. for buying off the increased rent of 40s. per an. Ibid, pp. 299–300, 323. Prefixing and. appending: (a) particular of the premises and memorandum by Richard Meredith, deputy auditor of the Duchy of Cornwall. The abovesaid Ward assigned to the abovesaid John North of Shippon, yeoman, 1664, Nov. 23. (b) Ratal by John Fisher, Deputy Surveyor General of Crown Lands, of said particular. 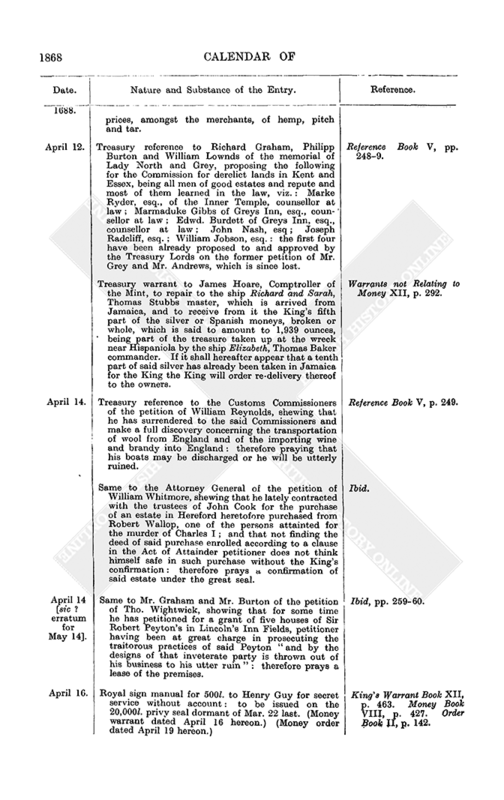 (c) Undated entry of the [Treasury Lords' signature of the] docquet of this lease. Same to same for a fresh lease to Nicho. Kemp of a tenement called Edon or Odon in the manor of Trelugan, co. Cornwall, formerly parcel of the lands of the Earl of Devon and now annexed to the Duchy of Cornwall: all as demised to [said] Nicho. Kemp 1673, June 13, for 99 years terminable on the lives of said Nicholas and John his son. The present lease is to be for 99 years, terminable on three lives, at the old rent of 24s. 10d. and fine of 40l. Ibid, pp. 303–4. Prefixing: (a) particular of the premises and memorandum by Richard Meredith and (b) ratal thereof by John Fisher, ut supra. The said Nicholas and his son John are both now alive. Same to same for a lease to Martyn Folkes of Grays Inn, co. Midd., and Edward Coleman of Furnivals Inn, gent. (at the nomination of and in trust for Edward King and Eliz. his wife, formerly wife of Nath. Fienns) of the parcel of wood or woodland in Bromby, co. Lincoln, commonly called Princess Wood, and containing 23 acres, 14 perches, lying next the land of the late Nath. Fienn, esq., and [being] parcel of the manor and soke of Kirton in Lindsey; and the coney warren (and the lodge thereon) in or near Bromby and Redbourne, extending east on the moors of Bromby, Frodingham, Eastmoor, Soumthorpe and Ashby, and late in the tenure of said Fienns or of John Hely and Nicholas Horle [his] sub-tenants: all as demised 1661, Nov. 25, to said Nath. Fienns for 31 years: and likewise of the fishing of Trent within the said soke of Kirton in Lindsey as demised to Edward Cooper, gent., 1628, June 17, for 99 years, terminable on the lives of Francis Cooper, son of said Edward Cooper, John Cate and Edward Cate. Ibid, pp. 305–9, 323. The present lease is to be for 31 years at the former rents of 20s. per an. for the wood ground; 3l. 7s. 4½d. per an. for the coney warren and 2s. 6d. per an. for the small fishing in the Trent or in all 4l. 9s. 10½d. per an., payable to the Receiver General of the Duchy of Cornwall or to the bailiff of the manor and soke of Kirton; and fine of 150l. for buying off the increased rent of 20l. 12s. 7½d. ; and 150l. for the present renewal. Prefixing and appending: (a) two particulars and memoranda of the above two sets of premises made out by Richard Meredith, ut supra. The premises are now held by Edward King, who married the widow of said Fiennes. (b) Two ratals by John Fisher, ut supra, of said particulars. (c) Undated entry of the Treasury Lords' signature of the docquet of this lease. Treasury warrant to the Clerk of the Pipe for a lease to Christopher Tooker, gent. (at the nomination of the Earl of Radnor), of the water or rivulet of Fowke or Fowey in co. Cornwall from the park of Restormel on the north to the bridge of Lostwithiel on the south and of the fishing in said water below Restormel Castle extending from the gate of St. Saviour, alias St. Savior, to the bridge called Reprenne, alias Reprinne Bridge, and from there as far as two yoked oxen can pass together in the said water: all as demised to Henry ("Heneritto") Seymour, esq., 1661, Nov. 31. The present lease is to be for 31 years from 1688, Lady day, at 50s. per an. rent and without fine, in view of the greatness of the rent which is near the full value of the premises. Warrants not Relating to Money XII, pp. 309–11, 347. Prefixing and appending: (a) particular of the premises and memorandum by Richard Meredith, ut supra. The premises are in the possession of said Tooker, who alleges he has a title thereto (by assignment from said Seymour) in trust for the Earl of Radnor, to whose seat they are contiguous. (b) Ratal by John Fisher, ut supra. (c) Entry, dated 1688, Aug. 13, of the Treasury Lords' signature of the docquet of this lease. Henry Guy to the Revenue Commissioners, Ireland. 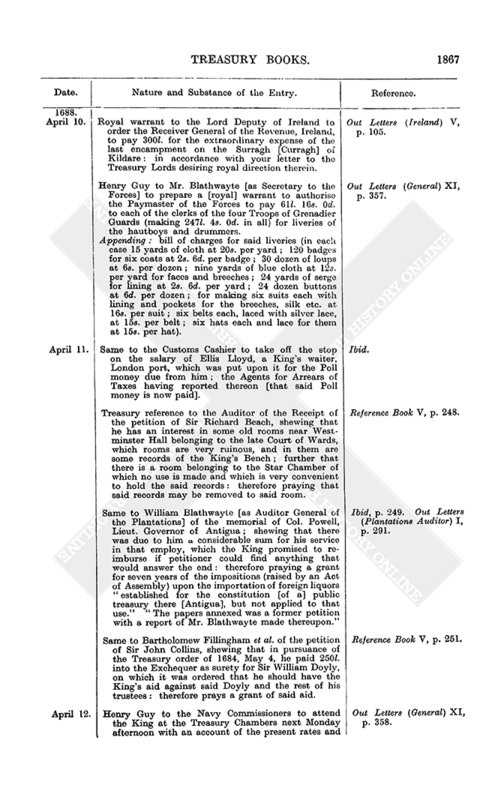 The Treasury Lords have put the bond of Mr. Geneu and Mr. Bridges (which you sent from Ireland) into the hands of Mr. Graham and Mr. Burton with instructions to prosecute same. Out Letters (Ireland) V, p. 101. The Treasury Lords to same. By the indenture of Aug. 5, last, ut supra, pp. 1423–5, provision is made that in collecting the arrears due to the late Farmers of the Revenue, Ireland, they will observe the instructions of the King, the Lord Lieutenant of Ireland or the Treasury Lords, England. In accordance herewith Sir John Temple, Solicitor General of Ireland, has (on reference from us) proposed the following regulations for this work. We approve thereof. This is therefore to give permission to two of you, together with one nominee of the said Farmers, to levy said arrears under the restrictions and methods so proposed; and at the costs and charges of the said Farmers. (1) The Farmers are first to give in to you a schedule of the arrears of Crown rents and quit rents. (2) Two of the said Commissioners and a nominee of the Farmers are to be entrusted with the collection, but the King is to receive no prejudice in his accruing rents or in his arrears thereof. (3) Where the lands or tythes liable are of so low value that they cannot well satisfy said arrears, together with the King's arrears and the growing rents, the Barons of the Exchequer, Ireland, may instal the said Farmers' arrears. (4) On the issue of process or orders for levying, a note in writing shall be left with the chief tenants as to said arrears and no distraint shall take place till after three months ensuing, so that the person liable may have time to apply for a discharge (in case of error) or an instalment. (5) Where the quit rents in question were afterwards reduced by the late Earl of Essex the arrears shall be demanded and paid only according to such reducements, though they grew due before the making thereof. Ibid, pp. 101–4. The Treasury Lords to the Lord Deputy of Ireland. On reading to the King your letter of Mar. 23 last concerning the additional days' pay to the Army (in which you opine that same cannot well be made till the revenue be in a better condition, in regard of the present scarcity of money and the great uncertainty whether the revenue will be sufficient to answer said addition) the King declared himself to be of the same opinion and has resolved not to make the addition till he has a better prospect to answer it from his revenue in Ireland. Out Letters (Ireland) V. pp. 104–5. The King also took notice of the difficulty you mention in sending over Lord Forbes's Regiment and the commanded men out of the Regiment of Guards "in respect of paying them from Ireland when they shall be here" [in England] and does therefore think it more for his service that the said men should not come. You are therefore to stop the orders for their coming, if given. The King intends to send Col. Mac-gully-cuddy and some of his officers to Chester and Liverpool, from thence to pass into Ireland to gather up the men that shall be reduced out of the Companies there according to the orders sent you by the Earl of Sunderland. It is therefore the King's pleasure that the said reducement be not made till the arrival of Col. Macgully cuddy or some of his officers on that account. Same to same to report on the petition of Elizabeth, Countess Dowager of James, Earl of Castlehaven. What has been paid to her since the King's accession? Ibid, p. 105. Appending: said petition, shewing that the late King settled upon her said husband 500l. per an. until 5,000l. should be paid him in one entire payment; and the said Earl settled same upon her in lieu of a jointure; but the Lord Deputy took same to be only a pension and on the Earl's death left the same out of the new establishment. 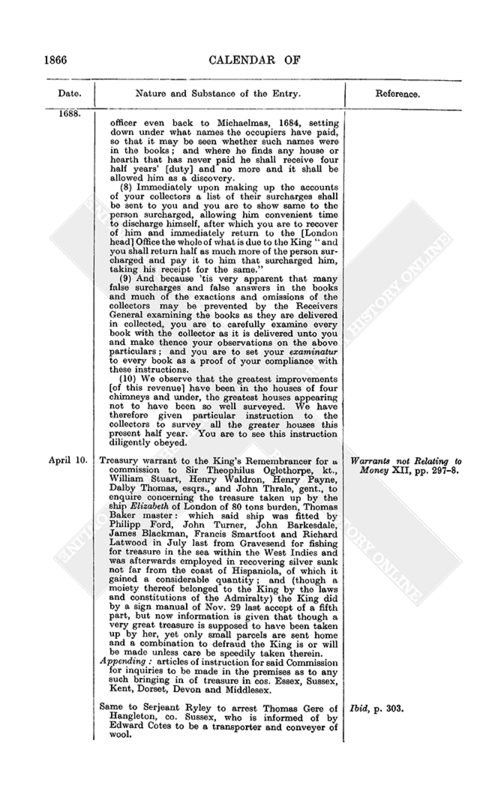 Henry Guy to Lord Dartmouth to report on the enclosed petition [missing] of the late King's servants belonging to the Stables, praying that the like pensions may be settled on them as are granted to the rest of their fellow servants. Out Letters (General) XI, p. 353. Same to the Navy Commissioners to report on the enclosed petition [missing, see supra, pp. 1820–1] of Sir Phineas Pett (with a report thereon by Mr. Fisher) concerning a lease of some barren lands lying eastward on the back of the dockyard, storehouses and ropehouses at Chatham. Have you any objections to said lease ? Ibid. Treasury reference to Bartholomew Fillingham, Thomas Hall, William Lowndes and Philip Ryley of a memorial of —, praying a grant of all such debts and arrears as are still owing [to the Crown] and excepted out of the Act of Oblivion of 12 Car. II. and for power to prosecute the recovery of same in the King's name. Reference Book V, p. 245. Same to the Customs Commissioners of the petition of William Talman, a King's waiter, London port, praying payment of 273l. due to him for 5¼ years' arrear on his salary; all his fellow King's waiters having duly received their arrears and growing salary, but petitioner being out of town was not included in their petition. Ibid, p. 246. Same to Sir John Osborn of the petition of Capt. Robt. Doughty, praying for some pension out of the Lotteries, his father and family having for their loyalty suffered in their estate above 8,000l. Ibid, p. 245. Same to Bartholomew Fillingham et al. of the petition of Tho. Whitley, esq., late Receiver General [of Crown Revenues] for North Wales and Chester; petitioner shewing that in his said receipt he succeeded Maurice Wynne, esq., a gentleman of great estate and relations in North Wales, who answered to the King in his yearly accounts several sums which he had not received and that the auditor obliged petitioner to answer all the revenue which his predecessor had answered, though many rents so answered as above were unlevied and desperate: that petitioner's brother, who has a patent for life of said office, was put out of the execution thereof for 500l. not paid to the Duke of Beaufort, and though this sum was soon after paid the office is granted to Mr. Harcourt: that on petitioner's and Mr. Samuel Hughson's accounts for 1685 and 1686 there is an ipsum remaining on petitioner and Hughson of 1,819l. 18s. 10d. in Wales and 64l. 4s. 7½d. in Cheshire, whereof 520l. 0s. 2½d. for Wales and 42l. 7s. 4d. for Cheshire is charged on petitioner and 204l. 16s. 11½d. for Wales and 63l. 12s. 1¾d. 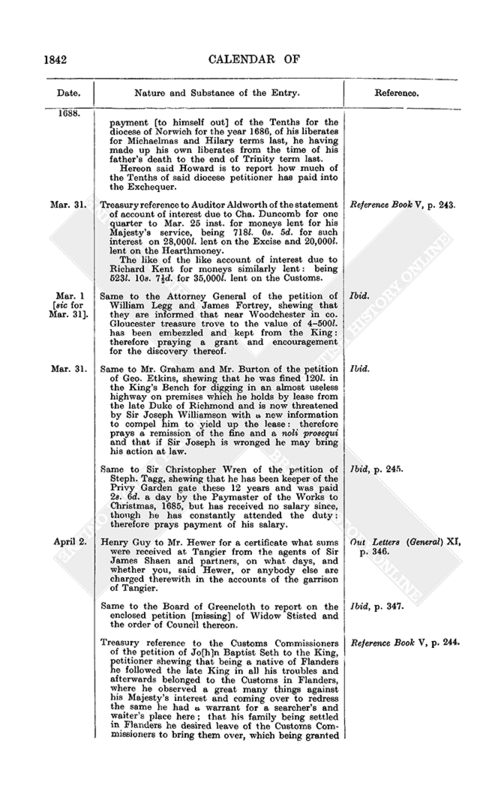 for Cheshire is charged as remains in the hands of several persons: that petitioner is willing to pay the residue of said debts to the King in some convenient time: therefore prays that the lost rents as above may be remitted and that Mr. Harcourt may be obliged to levy the abovesaid separate arrears of 204l. 16s. 11½d. for Wales and 63l. 12s. 1¾d. for Cheshire, seeing that the desperate rents became so by petitioner's predecessor answering them before he levied them: further prays time as above for payment of the remainder of said debt. Ibid, p. 250. Money warrant for 50l. to Bazill Fitzherbert for last Lady day quarter on his annuity or pension. (Money order dated April 9 hereon.) Money Book VIII, p. 420. Order Book II, p. 139. Same for 75l. to Dame Sophia Stuart for same on her same. Money Book VIII, p. 420. Same for 600l. to Sir Benj. Bathurst for interest, one year to Mar. 25 last, on 10,000l., remainder of 15,000l. by him advanced on the Excise. (Cancelled and replaced by the warrant of 1688, June 18, infra.) Ibid, p. 421. Money warrant for 2,500l. to the Queen for last Lady day quarter on her annuity as by the patent of 1686, Dec. 3. Money Book VIII, p. 422. Henry Guy to the Lord President [of the Privy Council] to give order for a [royal] warrant to admit John Brydall into the place of Clerk, of the Jewel House on the resignation of his father, Walter Brydall, the Master of the Jewel House having reported that said son is very fit for said place. Out Letters (General) XI, p. 354. The Treasury Lords to the Bishop of Lincoln. About a year ago several poor ministers in your diocese petitioned about their arrears of Tenths, which petition was referred to us 1686–7, Mar. 4, We referred same to the Agents for Taxes ("Agents who are authorised in the prosecution of arrears "), who wrote to you 1687, June 11, for a certificate of the value of the livings concerned and of the arrears of Tenths thereon. On your certificate in reply of Aug. 1 last the King ordered a release of said arrears by the privy seal of Feb. 22 last, supra, pp. 1773–5. In spite of this we have received fresh complaints from Mr. Charles Bertie, who has appeared in behalf of the clergy and others, that a sudden and rigorous course is taken of levying those very arrears, besides pretended fees. We have had inquiry made as to how this should come to pass and are informed that Mr. Prettyman, late Remembrancer [of First Fruits and Tenths], although he knew of the whole proceeding, made forth a Commission without our knowledge and sent it down into the country with a clause in it that if any incumbents had any matter of discharge to produce they should only be warned to bring the same into the Exchequer for the Court to advise upon. And Mr. Gilbert, your Lordship's secretary, though not ignorant in the premises, has been so busy herein that sequestrations are issued at a very unusual time of the year and moneys extorted from the incumbents. Such sequestrations are not for the King's service, but may serve inferior officers to gain their unjust fees, which we know they have from time to time exacted. Out of respect for you we have not sent for Mr. Gilbert in custody, but we desire you to command him to attend us. Also please send us a certificate of the livings in your diocese that are capable of the discharge of arrears intended by the privy seal as above. Ibid, pp. 355–6. Henry Guy to Mr. Bridgman, enclosing (by Lord Godolphin's order) a copy of the Treasury Lords' letter of April 5 to the Lord Deputy of Ireland, ut supra, p. 1853. Ibid, p. 357. Treasury warrant to the Customs Commissioners to repay to John Lovet 12l. 13s. 6d. which was paid at Bristol on a parcel of Irish linen diaper imported by him, ut supra, p. 1815, being the duty on diaper as foreign over and above the Custom as Irish linen. Further directions are hereby to be given to the officers of Bristol port, and other ports where any sort of Irish linen may be imported, to suffer the same to pass upon payment of [only] such Custom as has been usually paid for Irish linen cloth: all by reason that said Lovet has petitioned the Lord Deputy of Ireland, shewing that his father in his lifetime and petitioner since his death have been at great charge in improving the linen manufacture of Ireland; that petitioner employed a manufacture at Chapelizod and another in the north, whereby many score of poor families are relieved, and being desirous to advance the reputation and industry of Ireland petitioner did resolve to export said linen cloth etc. ut supra. Said Lovet's petition was forwarded to the Privy Council, England, by the Lord Deputy, with a supporting letter and a desire that all sorts of linen manufactured in Ireland and transported to England may pay only duty as Irish linen "to the end that trade so very happily begun may not thro' discouragement unfortunately fall"; and upon consideration of the Treasury Lords' report on said petition it is the King's pleasure that all sorts of linen manufactured in Ireland may pass upon such Custom only as Irish linen cloth. Out Letters (Customs) XI, pp. 135–6. 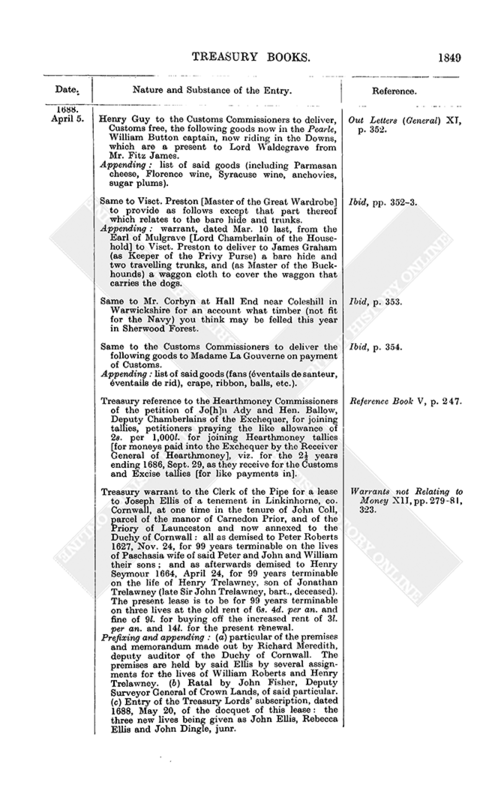 Treasury warrant to the Customs Commissioners to deliver, on payment of duty, parcels of molasses already landed as follows, to Giles Biggs, John Gyles, Richard Cary, — Wrayford, Jno. Gore, John de Grave, Gilbert Nelson,— Levero and— Rigden and to suffer them to enter the remainder of their parcels thereof that are already shipped and shall be imported on or before the 20th inst. : all by reason that said Biggs has petitioned on behalf of himself and others merchants of London, ut supra, p. 1841, shewing that ever since the Navigation Act molasses have been imported from France and Holland, being accompted the manufacture of those places, but now molasses from France is stopped on a doubt that the same is not a manufacture and therefore prohibited by said Act; petitioners praying not to be surprised herein without due notice, "it never having been the practice, where the King tries a new point in law, to insist upon the forfeiture either of ship or goods or to impose any burthen or difficulty upon the merchant in that particular case." 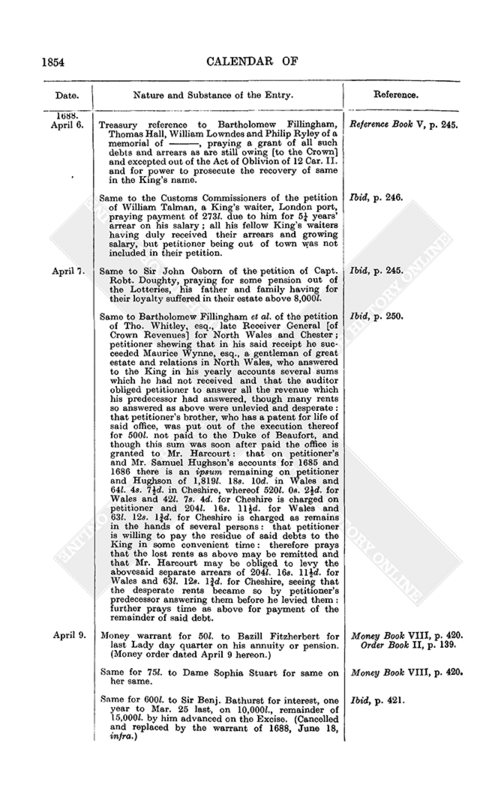 On which petition the Customs officers have reported that of late they noticed great importation of that commodity and that more was bought and coming from France and thought fit to put a stop thereto, having heard several of the sugar refiners and others in the case and taken the opinion of the Attorney General therein and other learned counsel, who all suppose such an importation contrary to the Navigation Act. Out Letters (Customs) XI, pp. 136–7. Same to same to permit Joseph Heme of London, merchant, to transport 66l. of crewel yarn desired from him by a correspondent at Antwerp, ut supra, p. 1755, for making a bed wherein (being a commodity prohibited [to be exported]) he could not gratify his said correspondent without Treasury permission, which permission he prays in regard the yarn is already wrought up and dyed and so manufactured here that it costs 5s. per lb. and [this parcel] is not designed for sale or merchandise [in Holland], but only for the said use, for a particular curiosity. Ibid, p. 138. Same to the King's Remembrancer to supersede process against John Thimelby on the bond in 1,500l., dated 1685, July 8, given by Robert Carr, Sir Adrian Scroope and said Thimelby to William Prettyman, Remembrancer of First Fruits and Tenths, which bond was found and seized upon a writ of extent formerly issued against said Prettyman and thereupon scire facias was awarded against said Thimelby, who exhibited a bill in the Exchequer for relief from same, but same was abated by the death of Prettyman, and Thimelby has since had his body and goods taken in execution, but has given bond to exhibit a bill of revivor and to prosecute same. Warrants not Relating to Money XII, p. 286. 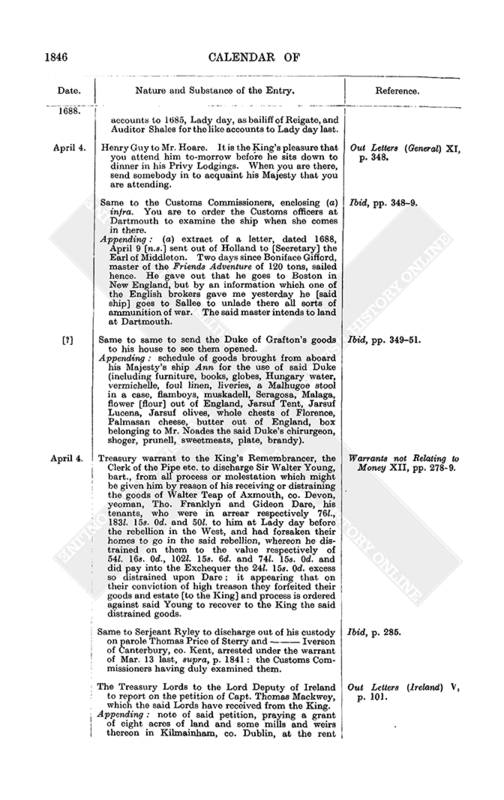 Treasury warrant to Serjeant Ryley to discharge out of his custody Joseph Edwards of Faversham, merchant, arrested ut supra, p. 1778: his discharge being at the request dated Mar. 28 last from the Customs Commissioners. Warrants not Relating to Money XII, p. 286. Same to same to similarly discharge William Renalls and Henry Gover, arrested ut supra, pp. 1778, 1840: on request as above. Ibid, p. 287. Same to same to arrest Stephen Keyzer, James Dourdaine, Peter Paint and Jasper L'Clarke of Canterbury as principal transporters of wool and employers of others in the transportation thereof. Ibid. Henry Guy to the Customs Commissioners to report on the enclosed letter [missing] sent by the Baron de Courtiiy to the Treasury Lords. Out Letters (General) XI, p. 363. Royal sign manual for 4,380l. 14s. 0d. to Henry Guy for secret service: without account: to be issued on the 20,000l. privy seal dormant of Mar. 22 last. (Money warrant dated April 10 hereon.) (Money order dated April 11 hereon.) King's Warrant Book XII, p. 439. Money Book VIII, p. 424. Order Book II, p. 140. Royal warrant to Brooke Bridges and Tho. Done, Auditors of Imprests, to allow in the account of Thomas Neale as Master and Worker of the Mint 748l. 3s. 1d. for the value of 3,000 medals delivered as follows to James Grahme, Keeper of the Privy Purse, for the King's use in healing, viz. 500 on Sept. 3 last, 1,000 on Sept. 8, 500 on Sept. 13 and 1,000 on Nov. 8: in accordance with Henry Guy's letter of Sept. 8 last. King's Warrant Book XII, p. 443. Same to same to similarly allow in account to said Neale 1,373l. 16s. 8d. for the value of 5,500 like medals delivered as follows (in accordance with Henry Guy's letters of Dec. 15, Jan. 31, Feb. 27 and Mar. 8 last), viz. : 1,000 delivered on Dec. 15 and 27 last; 500 on Feb. 1 last; 500 on Feb. 3; 500 on Mar. 1; 350 on Mar. 9; 650 on Mar. 14; 1,000 on Mar. 20; 1,000 on Mar. 29. Ibid, p. 444. Same to the Attorney General for a privy seal to discharge the baronetcy fee of 1,095l. due from Sir Wilfred Lawson of Isell, co. Cumberland. (Treasury warrant dated May 3 hereon for tallies of discharge accordingly.) Ibid, p. 444. Money Book VIII, p. 437. Same to the Attorney or Solicitor General for a great seal for a grant to Joseph Offley of the Middle Temple, esq., William Aldworth of St. Martin's in the Fields, esq., and William Lowndes of St. Margarets, Westminster, of the indentures of lease (and assignments thereon made) dated 1682, Nov. 20, between Andrew Hull of Frowlesworth, co. Leicester, gent., of the first part, Roger Smith of Frowlesworth, esq., of the second part and Robt. Snead, citizen and carpenter of London, of the third part, whereby the said Hull granted said Snead a piece of land in Channell Row or Cannon Row in St. Margarets, Westminster, 38 foot in front north to south and 44 foot in depth east to west, on which lately stood an old tenement in the tenure of Widow Carter, and an entry or passage under part of the same and under part of the tenement of Sarah Hankes leading from Channel Row into Dorset Court; together with the use of the house of office and the way leading to the same and to the water stairs in common with the rest of the tenants there; to hold for 51 years from Lady day then last past at 14l. per an. 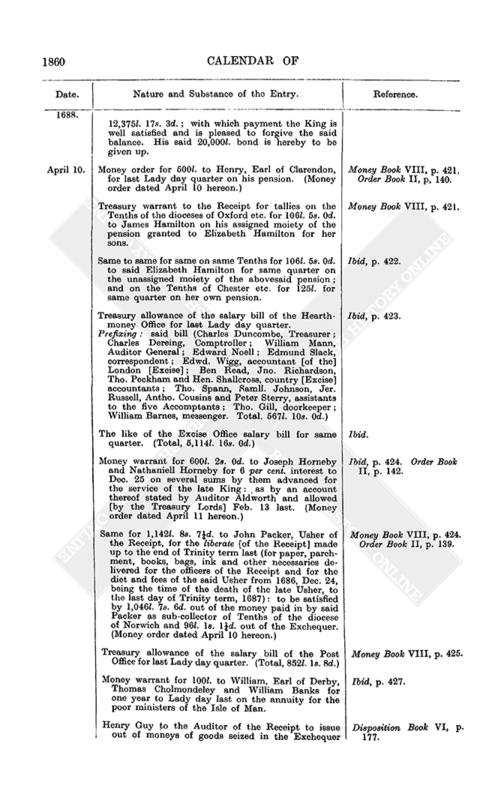 rent: on which ground the said Snead built two new messuages and did by indenture, dated 1683–4, Mar. 23, assign same to Ellinor then wife or reputed wife of William Bonnett, styled therein Ellinor Bonnett of St. Martin's in the Fields, widow. King's Warrant Book XII, pp. 445–54. And likewise the indenture of lease, dated 1683, June 14, whereby Edward Buckley, senr., of Putney, co. Surrey, Edward Noell of the Inner Temple, gent., Robert Clough of London, gent., Jno. Arrowsmith of London, apothecary, William Cloudsley of London, vintner, and John Vernon of London, merchant, let to said Robt. Snead a parcel of ground on the south side of Charles Street in St. Margaret's, Westminster, being the corner piece of ground of the street at the west end thereof and 30 feet in front east to west and 29 feet in depth north to south adjoining east a messuage late new built by Henry Sparks; to hold for 61 years from Lady day then last preceding at 12l. per an. rent. And likewise the indenture, dated 1683, June 14, whereby the said Buckley, Noell, Clough, Arrowsmith, Cloudsley and Vernon demised to said Snead a piece of ground on the east side of Duke Street in St. Margaret's, Westminster, "and intended for the second house from Charles Street" containing 17 foot in front north to south towards Duke Street, for the like term at 5l. 4s. 0d. per an. And likewise the indenture, dated 1683, June 14, whereby the said Buckley et al. as above, demised to said Snead the piece of ground on the east side of said Duke Street, intended for the third house from Charles Street, containing 21 foot in front north to south and 48 feet in depth east to west, for the like term at 8l. 10s. 0d. And likewise the indenture, dated 1683, June 14, whereby the said Buckley et al. as above, demised to said Snead another piece of ground on said east side of Duke Street, intended for the fourth house from Charles Street, being 22 feet in front and 48 feet in depth, for the like term at 8l. 16s. 0d. : all which four last recited indentures were by indenture, dated 1683, June 16, mortgaged to William Tallman of Chelsea for 313l. 10s. 0d., which was foreclosed and the said Tallman assigned same by endorsement to Claudius Denise of St. Martin's in the Fields, gent., whose name therein was used only in trust for the said Ellinor Bonnett: which said Ellinor was in 1 James II attainted of high treason and (by inquisition taken at the Quest House in St. Clements Danes 1686, Dec. 15, before Richard Graham et al.) it was found said William Bonnett, a cook then living, was an alien born in parts beyond the seas, to wit in France, and did marry said Ellinor after his coming into England and that she was his wife at the time of said inquisition: and the King is informed that by reason of said William Bonnett being an alien or by reason of his wife's attainder the abovesaid indentures and premises accrue to the King, who therefore hereby grants same as above, together with all other estate forfeited to the King by reason of the said William Bonnett's being an alien or by the treason of his wife and all arrears due thereon: all upon trust to dispose and apply the proceeds of same as they shall be directed by royal sign manual. 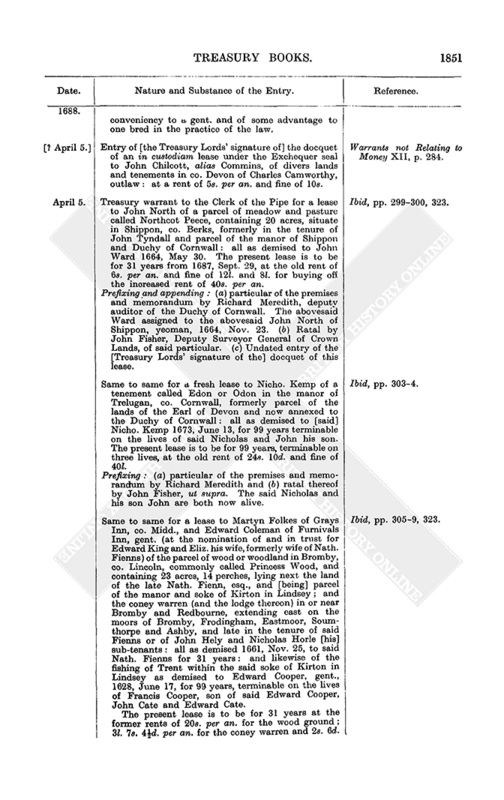 Royal warrant to the Clerk of the Signet for a privy seal for allowing as follows the account of the 10,000l. imprested in 1667 to William Avery, then Town Clerk of London, for the Mayor etc. of London for making several fortifications at Sheerness and several places on the Thames: in the said account for which as drawn by Auditor Thomas Done the said accomptants crave allowance of 7,612l. 6s. 8d. for moneys issued out of the Chamber of London to several persons upon account of the fortifications at Sheerness upon orders either from the Lord Mayor and Court of Aldermen or from the Committee of Aldermen, which were appointed by that Court to inspect the said works (including 84l. 11s. 10d. 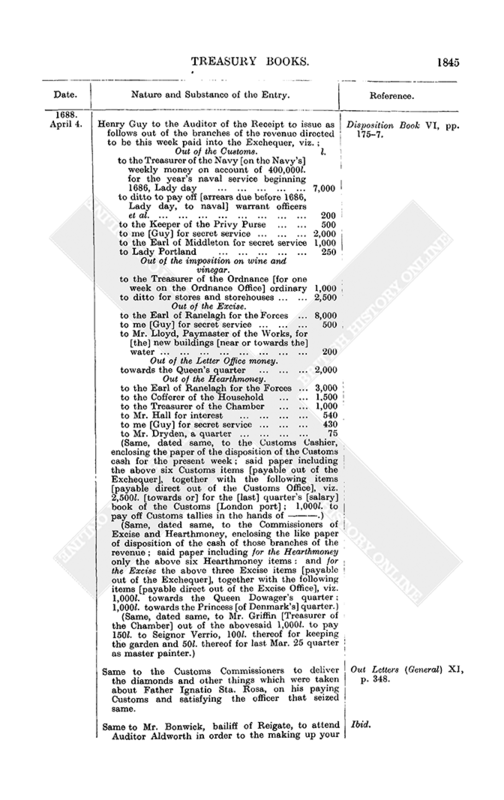 for [Exchequer] charges in receiving said 10,000l. ); and 1,801l. 5s. 0d. for like issues for the fortifications at Gravesend; and 655l. 4s. 0d. for the fortifications at Woolwich. The total allowances craved amount to 10,069l. 5s. 8d., leaving the accomptants in surplus 69l. 5s. 8d. 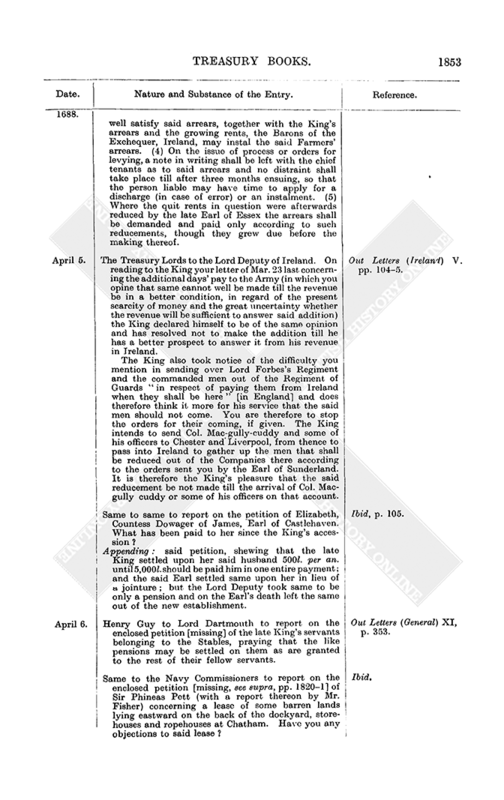 "And whereas it is doubted that the moneys issued as aforesaid out of the Chamber of London cannot by the strict rules of our Exchequer be allowed in such account because the particular expenditure thereof in and about the said works doth not appear," nevertheless the King being well satisfied that the said Committee of Aldermen did faithfully perform their trust therein and took care that the workmen performed their contract, although after so long a time the more particular accounts of the said works cannot be produced, therefore it is his pleasure that the account be passed in form as above without requiring any further vouchers for the same or any more particular account of the expenditure thereof. King's Warrant Book XII, pp. 454–5. Same to same for a same to discharge John, Lord Ossulston, of 375l. 17s. 3d., part of the 12,375l. 17s. 3d. which by the award of the late Treasurer Rochester, ut supra, pp. 1139–40, he was to refund to the King by reason that under colour of the privy seal of 1667, Oct. 5, he received certain sums between 1666, Michaelmas, and 1672, Michaelmas, for postage of letters and packets for the late King's service, during which time or some part thereof said Ossulston as assignee of Henry, late Earl of Arlington, was sub-farmer of the Post Office: upon which matter Sir Robert Sawyer, late Attorney General, exhibited an English bill in the Exchequer, 2 James II, against said Ossulston for recovery of said moneys, who appeared thereto and did give bond 1686, Nov. 3, in 20,000l. to abide by Treasurer Rochester's award therein; who accordingly did award ut supra; and thereupon the said Ossulston has since paid to the King 12,000l. in part of said 12,375l. 17s. 3d. ; with which payment the King is well satisfied and is pleased to forgive the said balance. His said 20,000l. bond is hereby to be given up. Ibid, pp. 455–6. Money order for 500l. to Henry, Earl of Clarendon, for last Lady day quarter on his pension. (Money order dated April 10 hereon.) Money Book VIII, p. 421. Order Book II, p, 140. Treasury warrant to the Receipt for tallies on the Tenths of the dioceses of Oxford etc. for 106l. 5s. 0d. to James Hamilton on his assigned moiety of the pension granted to Elizabeth Hamilton for her sons. Money Book VIII, p. 421. Same to same for same on same Tenths for 106l. 5s. 0d. to said Elizabeth Hamilton for same quarter on the unassigned moiety of the abovesaid pension; and on the Tenths of Chester etc. for 125l. for same quarter on her own pension. Ibid, p. 422. Treasury allowance of the salary bill of the Hearthmoney Office for last Lady day quarter. Ibid, p. 423. The like of the Excise Office salary bill for same quarter. (Total, 5,114l. 16s. 0d.) Ibid. Money warrant for 600l. 2s. 0d. to Joseph Horneby and Nathaniell Horneby for 6 per cent, interest to Dec. 25 on several sums by them advanced for the service of the late King:, as by an account thereof stated by Auditor Aldworth and allowed [by the Treasury Lords] Feb. 13 last. (Money order dated April 11 hereon.) Ibid, p. 424. Order Book II, p. 142. Same for 1,142l. 8s. 7¼d. to John Packer, Usher of the Receipt, for the liberate [of the Receipt] made up to the end of Trinity term last (for paper, parchment, books, bags, ink and other necessaries delivered for the officers of the Receipt and for the diet and fees of the said Usher from 1686, Dec. 24, being the time of the death of the late Usher, to the last day of Trinity term, 1687): to be satisfied by 1,046l. 7s. 6d. out of the money paid in by said Packer as sub-collector of Tenths of the diocese of Norwich and 96l. 1s. 1¼d. out of the Exchequer. (Money order dated April 10 hereon.) Money Book VIII, p. 424. Order Book II, p. 139. Treasury allowance of the salary bill of the Post Office for last Lady day quarter. (Total, 852l. 1s. 8d.) Money Book VIII, p. 425. Money warrant for 100l. 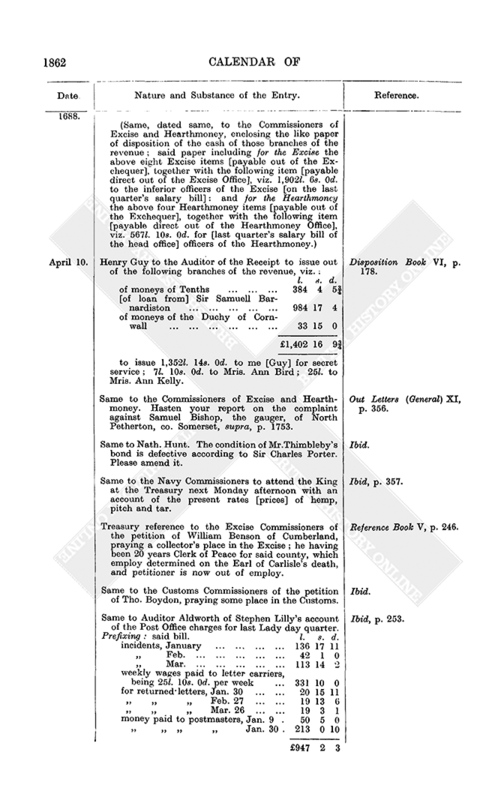 to William, Earl of Derby, Thomas Cholmondeley and William Banks for one year to Lady day last on the annuity for the poor ministers of the Isle of Man. Ibid, p. 427. Henry Guy to the Auditor of the Receipt to issue out of moneys of goods seized in the Exchequer 500l. to the Earl of Clarendon; 75l. to Lady Stuart and 50l. to Mr. Fitzherbert. Disposition Book VI, p. 177. Henry Guy to the Auditor of the Receipt to issue (out of the next money of Tenths that shall be paid into the Exchequer) 50l. to Samuel Morland, esq., for last Lady day quarter on his pension. Disposition Book VI, p. 177. Same to same to issue as follows out of the branches of the revenue directed to be this week paid into the Exchequer, viz. : Ibid, pp. 177–8. Out of the Customs. l. s. d.
Out of the loans on French linen. Henry Guy to the Auditor of the Receipt to issue out of the following branches of the revenue, viz. : Disposition Book VI, p. 178. Prefixing: said bill i. s. d.
Treasury warrant to Sergt. Ryley to detain in custody Thomas Rowe of Dover until he has answered the accusation of being a transporter and conveyor of wool. Warrants not Relating to Money XII, p. 289. Same to the Clerk of the Pipe for a lease to George Moore of London, merchant, of a piece of land of 165 acres, commonly called Simonds Hill, Grange Hill or Rengybanke, alias Rinjabancke, parcel or reputed parcel of the King's forest called Delamere Forest, co. Chester, and now or late encroached by John Davyes of Manley, co. Chester, in the south part of said forest and in or near the parish of Frodsham. The present lease to be for 31 years from Lady day last at 5l. per an. rent, payable from the time the lessee recovers quiet possession of the premises, which he is to covenant to do within three years. Ibid, pp. 290–1. Prefixing: constat and ratal of the premises by John Fisher, Deputy Surveyor General of Crown Lands. This constat is grounded upon a survey and map taken by Thomas Dawson, [a] surveyor of lands, in Oct., 1686, and the oaths of several witnesses taken before Peter Shackerley, Governor of Chester. Treasury approval of instructions as follow for the collectors of Hearthmoney. The Hearthmoney Commissioners are hereby to print same and give them in charge to the respective officers. Ibid, pp. 293–5. For the Collectors of Hearthmoney. (1) Wherever the collector finds a false name in the book he is to make as cratch through it and write in the name of the present occupier. For every failure herein he is to forfeit 6d. to the discoverer. (2) Where the growing charge and arrear are not both received a full and clear answer is to be given in the book to satisfy the Commissioners of the reason of it. If no answer be given or a short or stale answer the collector to forfeit as above. (3) Where any house is returned certified the name of the landlord is to be certified with it. If there be no landlord it is to be returned as a parish house, but a bare certificate without further declaration will be judged a short answer and punished as such. (4) In his answers the collector is to carefully distinguish which are "non such's" what "demolishments" and what "overcharges." (5) No house to be returned "non such" but such where the collector is fully satisfied upon diligent enquiry in the neighbourhood that there never was in their remembrance such person nor any house that such person could be presumed to have lived in. (6) When any house or hearth is returned as "demolished' the time of the demolishment is to be set down; and if it be an entire house demolished, who was the last occupier. (7) Nothing is to be returned as an overcharge but [in cases] where more hearths go out in charge in any house than are in such house. (8) That in houses with not more than two chimneys where the inhabitants are or may pretend to be exempt by poverty or by certificate the collector is to enquire diligently whether the inhabitant be the owner (and if so not to receive the duty) or the tenant, and if the latter then to enquire the name and abode of the landlord or landlady and the date of the tenancy and if it be let since 1663 they are to recover the duty from the landlord. (9) They are likewise to return the name and abode of the landlord of any house divided into several dwellings where the tenants do or may claim exemption by reason of poverty as above; and likewise the name of the tenant and the date of the tenancy. (10) Where any house stands empty the collector is to return the name and abode of the owner and the name and abode of the last occupier and the date of leaving. (11) The collector is to enquire what is the rent of all pauper houses that are or ought to be paid for by the landlords, setting down the rent to each man's name in his book of collection with the name of the landlord and where he is well satisfied that no rent is paid he is to declare it in his book. (12) All houses or chimneys that are building are to be taken notice of by the collectors and entered in the blank place of the folio: but where a hearth has continued unlaid for more than one half year and is charged [as] for a hearth the collector is to give answer in the blank place of the folio. (13) No collector is to distrain upon a person receiving alms by reason of his poverty though living in a house of his own worth above 20s. per an., provided that such house contain not more than two chimneys. (14) If any collector distrain a pauper tenant for duty which ought to have been paid by the landlord he shall lose his allowance and return the money received for such distress. (15) If any collector receive more than four half years' duty or receive money for penalties without judgment of the justices or restores not the overplus upon a distress, he shall repay the money unjustly received or detained and be discharged from his employment. (16) If any collector takes money and gives no acquittance or not in full for what he receives he shall be discharged. (17) The collector in every acquittance is to refer to the page and line of his book on pain to forfeit (to the discoverer) 6d. for each neglect. (18) No collector is to collect by other books or papers than the books sent out of the [Hearthmoney] Office for the half year's collection, on pain of forfeiture of employment. All books or papers in the hands of any officer, constable or other person by which any money has been or may be collected are to be sent up to the office. (19) No collector is to employ a constable to collect for him or is to collect by a deputy on pain of forfeiture of his employment. (20) Every collector is to inspect the precedent collector's receipts and if the arrears charged appear to be [have been] received by such predecessor, then he is to surcharge him therewith, entering the date of that acquittance against the arrear in the blank place in the folio. (21) Every collector is to carefully survey all the greater houses in their collection for the 1688, Lady day, duty and if it be found by any future discovery that any collector has neglected to survey any such house, whereby the King has lost one or more half year's duty the negligent collector shall make good the loss to the King and pay a shilling to the discoverer. The like Treasury approval of instructions as follows for the General Receivers of Hearthmoney; which are in consequence of the discovery (from examining the books of the two last half years) of great neglects of former instructions. The instructions which relate to the under officers [viz. collectors as above] are drawn up by themselves [i.e. separately as above]. You are to take care they be punctually observed. Those which concern yourselves are as follows: Warrants not Relating to Money XII, pp. 295–6. (1) That the Receivers General take the totals of the pages, names, number of hearths, arrears and surcharges of the [collectors'] books and keep such totals in a book for that purpose. (2) That they take receipts from the collectors for all the books they deliver them and without favour shown to or reward taken from any collector. (3) That no new half year's book be delivered to any collector till he has cleared his books, paid in his whole money and adjusted his receipts for the former half year. (4) That he note upon the books the date of the delivery out and return back thereof. 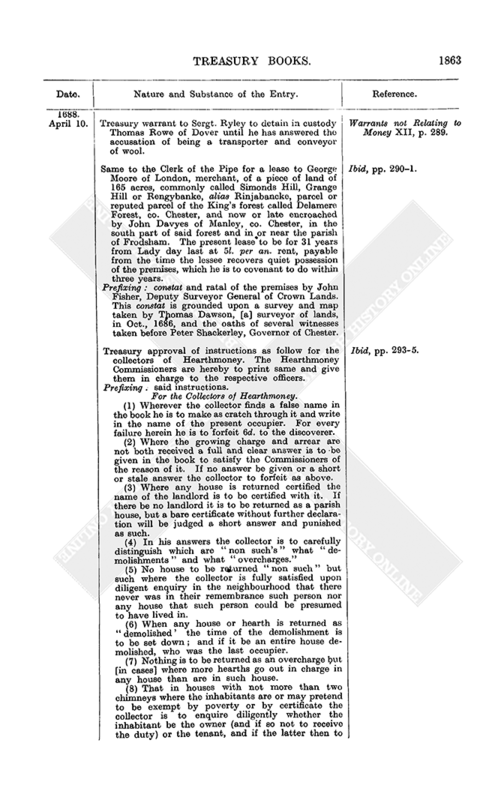 (5) That with the respective collectors the Receiver General sign and date upon and in every respective book (and not in the abstract paper) the receipt of the money and the date thereof. 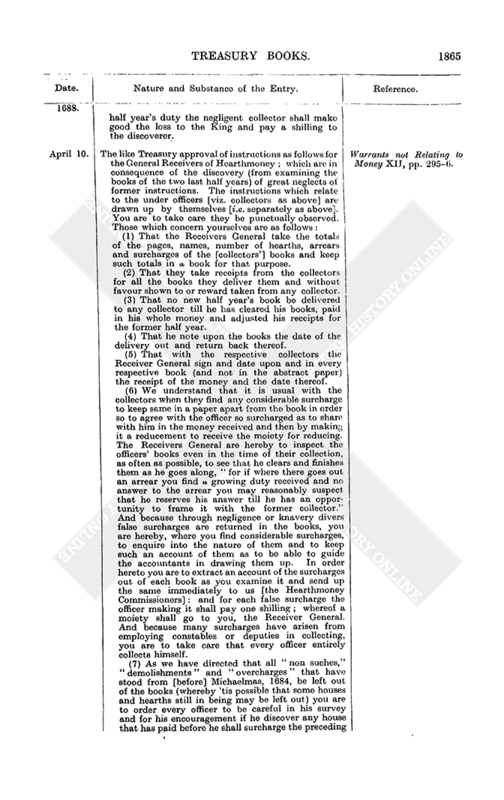 (6) We understand that it is usual with the collectors when they find any considerable surcharge to keep same in a paper apart from the book in order so to agree with the officer so surcharged as to share with him in the money received and then by making it a reducement to receive the moiety for reducing. The Receivers General are hereby to inspect the officers' books even in the time of their collection, as often as possible, to see that he clears and finishes them as he goes along, "for if where there goes out an arrear you find a growing duty received and no answer to the arrear you may reasonably suspect that he reserves his answer till he has an opportunity to frame it with the former collector." And because through negligence or knavery divers false surcharges are returned in the books, you are hereby, where you find considerable surcharges, to enquire into the nature of them and to keep such an account of them as to be able to guide the accountants in drawing them up. 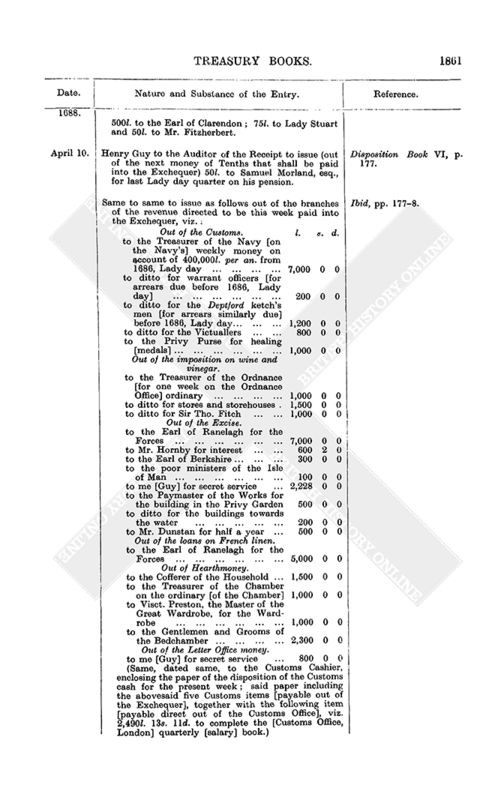 In order hereto you are to extract an account of the surcharges out of each book as you examine it and send up the same immediately to us [the Hearthmoney Commissioners]: and for each false surcharge the officer making it shall pay one shilling; whereof a moiety shall go to you, the Receiver General. And because many surcharges have arisen from employing constables or deputies in collecting, you are to take care that every officer entirely collects himself. (7) As we have directed that all "non suches," "demolishments" and "overcharges" that have stood from [before] Michaelmas, 1684, be left out of the books (whereby 'tis possible that some houses and hearths still in being may be left out) you are to order every officer to be careful in his survey and for his encouragement if he discover any house that has paid before he shall surcharge the preceding officer even back to Michaelmas, 1684, setting down under what names the occupiers have paid, so that it may be seen whether such names were in the books; and where he finds any house or hearth that has never paid he shall receive four half years' [duty] and no more and it shall be allowed him as a discovery. 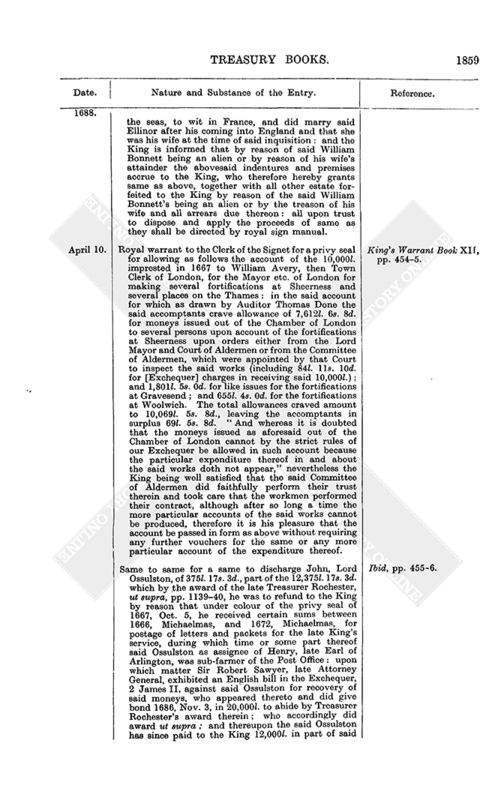 (8) Immediately upon making up the accounts of your collectors a list of their surcharges shall be sent to you and you are to show same to the person surcharged, allowing him convenient time to discharge himself, after which you are to recover of him and immediately return to the [London head] Office the whole of what is due to the King "and you shall return half as much more of the person surcharged and pay it to him that surcharged him, taking his receipt for the same." (9) And because 'tis very apparent that many false surcharges and false answers in the books and much of the exactions and omissions of the collectors may be prevented by the Receivers General examining the books as they are delivered in collected, you are to carefully examine every book with the collector as it is delivered unto you and make thence your observations on the above particulars; and you are to set your examinatur to every book as a proof of your compliance with these instructions. (10) We observe that the greatest improvements [of this revenue] have been in the houses of four chimneys and under, the greatest houses appearing not to have been so well surveyed. We have therefore given particular instruction to the collectors to survey all the greater houses this present half year. You are to see this instruction diligently obeyed. Treasury warrant to the King's Remembrancer for a commission to Sir Theophilus Oglethorpe, kt., William Stuart, Henry Waldron, Henry Payne, Dalby Thomas, esqrs., and John Thrale, gent., to enquire concerning the treasure taken up by the ship Elizabeth of London of 80 tons burden, Thomas Baker master: which said ship was fitted by Philipp Ford, John Turner, John Barkesdale, James Blackman, Francis Smartfoot and Richard Latwood in July last from Gravesend for fishing for treasure in the sea within the West Indies and was afterwards employed in recovering silver sunk not far from the coast of Hispaniola, of which it gained a considerable quantity; and (though a moiety thereof belonged to the King by the laws and constitutions of the Admiralty) the King did by a sign manual of Nov. 29 last accept of a fifth part, but now information is given that though a very great treasure is supposed to have been taken up by her, yet only small parcels are sent home and a combination to defraud the King is or will be made unless care be speedily taken therein. Warrants not Relating to Money XII, pp. 297–8. Appending: articles of instruction for said Commission for inquiries to be made in the premises as to any such bringing in of treasure in cos. Essex, Sussex, Kent, Dorset, Devon and Middlesex. 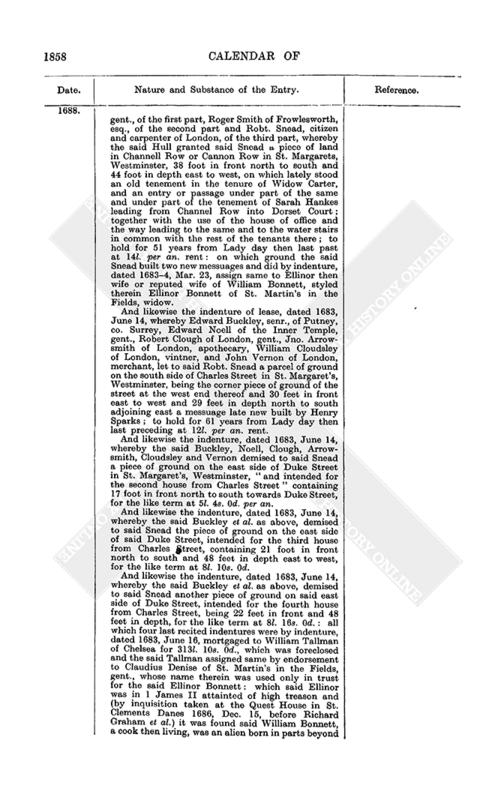 Same to Serjeant Ryley to arrest Thomas Gere of Hangleton, co. Sussex, who is informed of by Edward Cotes to be a transporter and conveyer of wool. Ibid, p. 303. Royal warrant to the Lord Deputy of Ireland to order the Receiver General of the Revenue, Ireland, to pay 300l. for the extraordinary expense of the last encampment on the Surragh [Curragh] of Kildare: in accordance with your letter to the Treasury Lords desiring royal direction therein. Out Letters (Ireland) V, p. 105. Henry Guy to Mr. Blathwayte [as Secretary to the Forces] to prepare a [royal] warrant to authorise the Paymaster of the Forces to pay 61l. 16s. 0d. to each of the clerks of the four Troops of Grenadier Guards (making 247l. 4s. 0d. in all) for liveries of the hautboys and drummers. Out Letters (General) XI, p. 357. Appending: bill of charges for said liveries (in each case 15 yards of cloth at 20s. per yard; 120 badges for six coats at 2s. 6d. per badge; 30 dozen of loups at 6s. per dozen; nine yards of blue cloth at 12s. per yard for faces and breeches; 24 yards of serge for lining at 2s. 6d. per yard; 24 dozen buttons at 6d. per dozen; for making six suits each with lining and pockets for the breeches, silk etc. at 16s. per suit; six belts each, laced with silver lace, at 15s. per belt; six hats each and lace for them at 15s. per hat). Same to the Customs Cashier to take off the stop on the salary of Ellis Lloyd, a King's waiter, London port, which was put upon it for the Poll money due from him; the Agents for Arrears of Taxes having reported thereon [that said Poll money is now paid]. Ibid. Treasury reference to the Auditor of the Receipt of the petition of Sir Richard Beach, shewing that he has an interest in some old rooms near Westminster Hall belonging to the late Court of Wards, which rooms are very ruinous, and in them are some records of the King's Bench; further that there is a room belonging to the Star Chamber of which no use is made and which is very convenient to hold the said records: therefore praying that said records may be removed to said room. Reference Book V, p. 248. Same to William Blathwayte [as Auditor General of the Plantations] of the memorial of Col. Powell, Lieut. Governor of Antigua; shewing that there was due to him a considerable sum for his service in that employ, which the King promised to reimburse if petitioner could find anything that would answer the end: therefore praying a grant for seven years of the impositions (raised by an Act of Assembly) upon the importation of foreign liquors "established for the constitution [of a] public treasury there [Antigua], but not applied to that use." 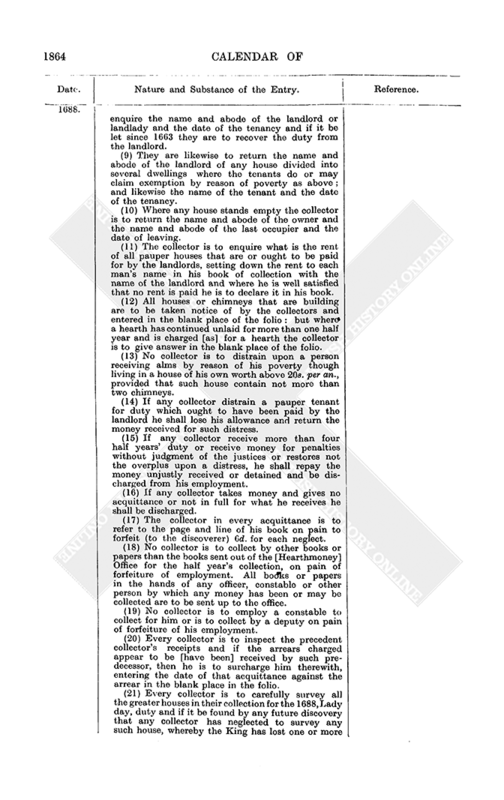 "The papers annexed was a former petition with a report of Mr. Blathwayte made thereupon." Ibid, p. 249. Out Letters (Plantations Auditor) I, p. 291. Same to Bartholomew Fillingham et al. of the petition of Sir John Collins, shewing that in pursuance of the Treasury order of 1684, May 4, he paid 250l. into the Exchequer as surety for Sir William Doyly, on which it was ordered that he should have the King's aid against said Doyly and the rest of his trustees: therefore prays a grant of said aid. Reference Book V, p. 251. Henry Guy to the Navy Commissioners to attend the King at the Treasury Chambers next Monday afternoon with an account of the present rates and prices, amongst the merchants, of hemp, pitch and tar. Out Letters (General) XI, p. 358. Treasury reference to Richard Graham, Philipp Burton and William Lownds of the memorial of Lady North and Grey, proposing the following for the Commission for derelict lands in Kent and Essex, being all men of good estates and repute and most of them learned in the law, viz. : Marke Ryder, esq., of the Inner Temple, counsellor at law; Marmaduke Gibbs of Greys Inn, esq., counsellor at law; Edwd. Burdett of Greys Inn, esq., counsellor at law; John Nash, esq; Joseph Radcliff, esq. ; William Jobson, esq. : the first four have been already proposed to and approved by the Treasury Lords on the former petition of Mr. Grey and Mr. Andrews, which is since lost. Reference Book V, pp. 248–9. Treasury warrant to James Hoare, Comptroller of the Mint, to repair to the ship Richard and Sarah, Thomas Stubbs master, which is arrived from Jamaica, and to receive from it the King's fifth part of the silver or Spanish moneys, broken or whole, which is said to amount to 1,939 ounces, being part of the treasure taken up at the wreck near Hispaniola by the ship Elizabeth, Thomas Baker commander. If it shall hereafter appear that a tenth part of said silver has already been taken in Jamaica for the King the King will order re-delivery thereof to the owners. Warrants not Relating to Money XII, p. 292. Treasury reference to the Customs Commissioners of the petition of William Reynolds, shewing that he has surrendered to the said Commissioners and make a full discovery concerning the transportation of wool from England and of the importing wine and brandy into England: therefore praying that his boats may be discharged or he will be utterly ruined. Reference Book V, p. 249. Same to the Attorney General of the petition of William Whitmore, shewing that he lately contracted with the trustees of John Cook for the purchase of an estate in Hereford heretofore purchased from Robert Wallop, one of the persons attainted for the murder of Charles I; and that not finding the deed of said purchase enrolled according to a clause in the Act of Attainder petitioner does not think himself safe in such purchase without the King's confirmation: therefore prays a confirmation of said estate under the great seal. Ibid. [sic ? erratum for May 14]. Same to Mr. Graham and Mr. Burton of the petition of Tho. Wightwick, showing that for some time he has petitioned for a grant of five houses of Sir Robert Peyton's in Lincoln's Inn Fields, petitioner having been at great charge in prosecuting the traitorous practices of said Peyton "and by the designs of that inveterate party is thrown out of his business to his utter ruin": therefore prays a lease of the premises. Ibid, pp. 259–60.